Looking for a job in the great outdoors? Love animals? Like money? Then you might take a look at a growing new business in the U.S. -- renting out animals to clear troublesome brush. The goat herd of Rent-A-Ruminant LLC is over 100 strong and voracious, cleaning up parks, construction sites, school grounds and private business greenery in the Seattle area. The company erects an electric fence around the land to be cleared of unwanted botany such as blackberry bushes, ivy, morning glories (my personal torment), nettles, thistles and the like. The goats can work steep slopes where machines can't, precluding the necessity of using herbicides. They also fertilize the ground as they work. And they're way cuter than a tractor or a brush hog. The goats don't work for peanuts,though. Owner Tammy Dunakin told me via e-mail that their average job requires a herd of 60 or 120, which costs $750 a day, usually with a three-day minimum and a setup and transportation charge of $350 to $500. They also offer a 15-head herd for $250 a day. 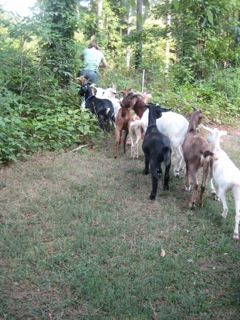 Goats have also been used successfully in the southeast to fight the widespread plant pestilence, kudzu. Yes, this could be a cool business opportunity, but you know who has an even better job than the goat-herder? The goats; they eat for a living!. 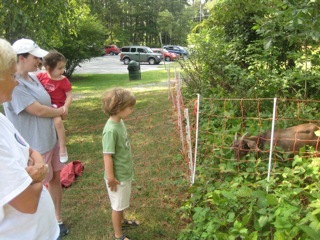 Carrboro, NC, the site of Beyond Pesticides’ 27th National Pesticide Forum, is the latest town to join the list of states and communities employing goats for nontoxic weed control. Communities across the nation, from Maryland to Wyoming to California, are discovering that grazing goats is a great option for land that suffers from unwanted plants, low organic matter and soil compaction. 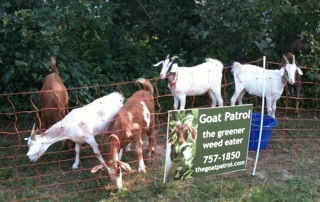 Goats eat weeds, add fertilizer and aerate the soil with their hooves, all at the same time. 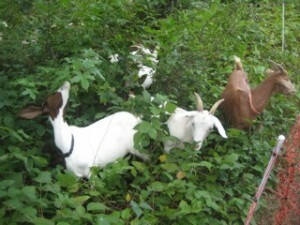 The town of Carrboro hired Goat Patrol, a targeted grazing service based in the Research Triangle region of North Carolina, to control a poison ivy infestation in a town dog park. The company, which currently consists of 16 goats, is owned and operated by Alix Bowman. Ms. Bowman says the inspiration for the business was found knee deep in a patch of English Ivy, which she was struggling to remove to make way for a garden. “If only I had some goats,” she thought. Four months later, the business school graduate returned to her farming roots and started the Goat Patrol. Of 30 commonly used lawn and landscape pesticides, 14 are probable or possible carcinogens, 15 are linked with birth defects, 21 with reproductive effects, 24 with neurotoxicity, 22 with liver or kidney damage, and 27 are sensitizers and/or irritants. Aside from being healthier for people and the environment, goats are often a cheaper option and provide a better long-term solution to the problem. For more information on natural, non-chemical land management strategies, read “Successfully Controlling Noxious Weeds with Goats: The natural choice that manages weeds and builds soil health” by Lani Malmberg; watch the video from the “Organic Land Management: Lawns, gardens and open spaces” workshop at the 27th National Pesticide Forum in Carrboro, NC and see Beyond Pesticides’ Lawn and Landscape pages. 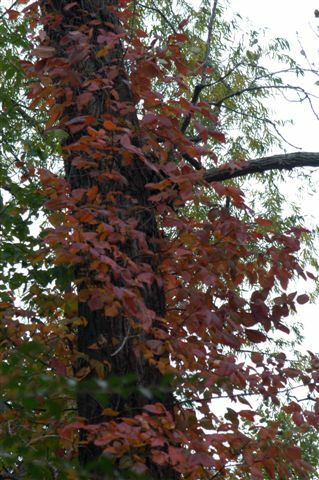 Poison Ivy with Fall color. The organiphobes recommend spraying 2,4-D and other toxic herbicides but that's a very bad idea. Toxic products contaminate the soil, the water, the air, wildlife, pets, you and me. Plus, they don't work very well anyway. 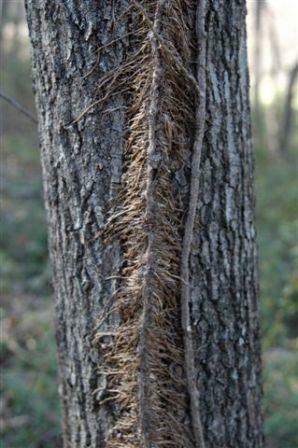 Besides being very dangerous toxic chemical for the soil, water, air and you, it will kill your trees. Poison ivy must be physically removed. Goats will eat it into oblivion for you or you can hire someone to dig it out. Then as it starts to grow back, the young returning growth can be sprayed with the vinegar-based herbicide. Add one ounce of d-limonene such as orange oil and one teaspoon liquid soap to one gallon of 10% vinegar made from grain alcohol. The skin rash can be treated with the juice of comfrey. When applied early on, it is quite effective. 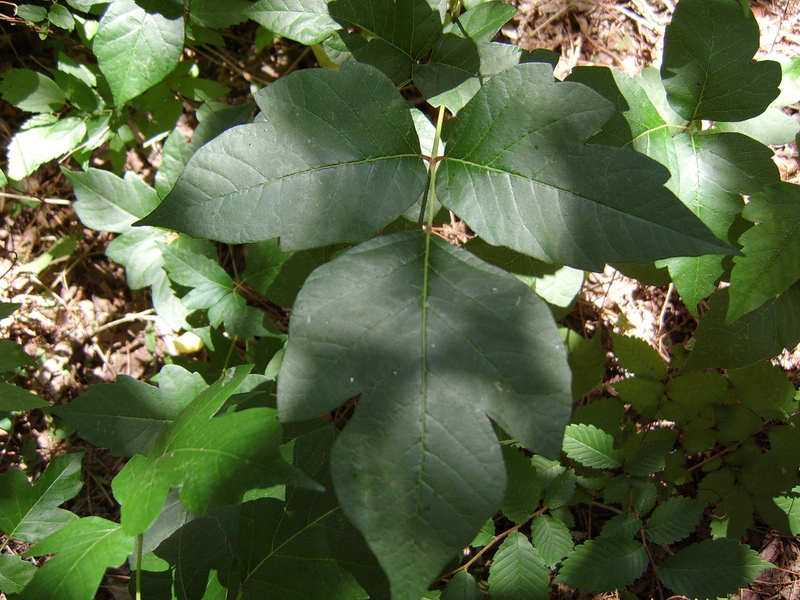 Poison oak has a more oak-like leaf but has the same properties as poison ivy. Poison Ivy "Leaves of three...let them be!" this non-blooming vine if you touch it when trying to remove it. Answer: Cutting the vines to the ground now and digging out as much of the plant as possible is Step 1. Next, spray the tender growth as it emerges in the spring. Instead of using toxic broadleaf herbicides such as 2,4-D, use vinegar-based organic herbicides. Your only other option is to buy or rent some goats. They love to eat poison ivy.